Residents said they are now afraid for the safety of small pets and children in the neighborhood. A South Bay neighborhood is on edge after a bobcat was spotted roaming in the area. 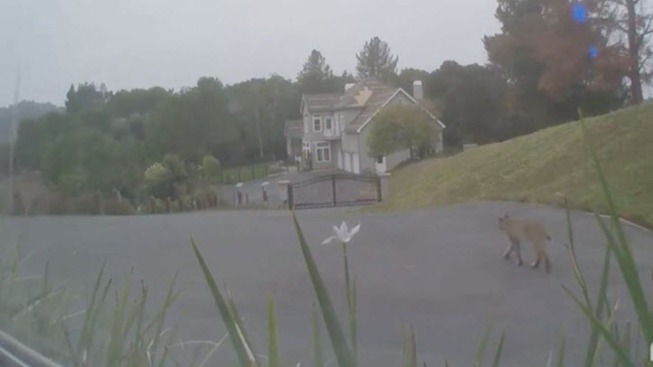 Home surveillance video shows the bobcat wandering around Saratoga around 6:30 a.m. Wednesday. The resident whose surveillance cameras captured the bobcat shows the animal in his driveway. Residents said they are now afraid for the safety of small pets and children in the neighborhood. But animal control experts said there is not much they can do about it. The Department of Fish and Wildlife said bobcat sightings in the area are common and its highly unlikely that a bobcat would attack a human. DFW officials said the best thing for the homeowner to do is take preventative measures: avoid leaving food outside, make sure your garbage is sealed, and to keep an eye on your children and pets. Still, residents like Uday Rau said more should be done. "Until somebody gets hurt or an animal attacks, they're not going to come out," Rau said. "So we're sort of left with the situation of having to fend for ourselves until somebody gets hurt."